EDMUND PRIESTLEY was born in the hamlet of Goodshaw Chapel in the parish of Higher Booths at 10.29 a.m. on 21 August 1778. He was the second child and eldest son of the shoemaker Robert Priestley and Mary Heap. Goodshaw Chapel was the name of the hamlet which had grown up around the Baptist Chapel, not far from Goodshaw village. It was in the Forest of Rossendale, east Lancashire. Edmund’s mother died when he was eight. His father married again to Molly (Mally, Melly) Heap, who may have been Mary’s sister. As well as his brother and two sisters, Edmund’s family now grew to include two half-sisters and a half-brother. His father died when he was fourteen, but Edmund followed in his footsteps as a shoemaker. He too may have married into the Heap family of Haslingden. It is possible, though not certain, that he is the ‘Edmond Pricestly’ who married Esther Heap in Haslingden, in 1803. He would then have been in his early 20s. Among the entries for Rossendale in Piggot’s Directory for 1828 was ‘Heap, Jonathan, Newchurch, Newchurch, boot and shoemakers.’ It is thus possible that the shoemaker Edmund married the boss’s daughter. They set up home in the traditional Priestley territory of Higher Booths. Here, around 1804, Edmund was baptized in Goodshaw Baptist Church by the Rev John Pilling. Sunnybank lay towards the south end of Goodshaw Lane, between Love Clough and Crawshawbooth. Alfred Priestley also lists Mary and Peggy, but he has probably confused these with the children of Edmund’s second marriage. Esther seems to have died around this time. Edmund married his second wife Ann Eastwood in 1811. ANN EASTWOOD was born on 20 March 1788. She was said to be of the Shenton and Pickup families. We may assume that, like the Heaps, she lived in Haslingden, at least as a young woman, since that is where she married Edmund Priestley. She was baptized as a young adult at Goodshaw Baptist Church, by the Rev John Pilling. Churches provided for the social life of their members, as well as their spiritual needs. It was probably here that Edmund and Ann’s romance blossomed. The marriage took place on 29 October 1811. When Ann was 23 and Edmund 33. The couple returned to Edmund’s home in Crawshawbooth, further up the valley, with Ann as stepmother to his children. They were still at Sunnybank when Ann’s babies were born. Mary dau of Edmund (shoemaker) and Ann (nee Eastwood) Sunnybank, Crawshawbooth born 12-Aug 1812. Peggy dau of Edmund and Ann Sunnybank, Crawshawbooth born 05-Apr-1814. James son of Edmund and Ann Sunnybank, Crawshawbooth born 23-Aug-1819. Ellen dau of Edmund and Ann Sunnybank, Crawshawbooth born 23-May-1829. According to Pigot’s Rossendale Directory of 1828 there was a business called: Priestley & brothers, Haslingden, Clowes, miscellaneous. It may have been a shop. Higher and Lower Clowes are at Townsendfold, half a mile south of Rawtenstall on the Bury road. 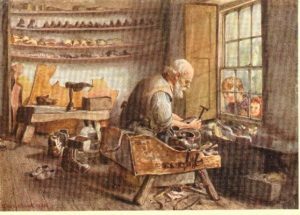 Shoemaking was a cottage industry in the mid-nineteenth century. Baines’ Directory of 1824 lists 16 shoemakers in Haslingden, but only one in Crawshawbooth (Joseph Binns, a leather cutter). There were 65 boot and shoe makers listed in Pigot’s 1828 Rossendale Directory (mostly in Bury). Of these, two were in Crawshaw Booth (Thomas Foxalls and Henry Terry). However, there were five others in Newchurch parish and more in Haslingden. The fact that there is no Priestley shoemaker in this 1828 Directory suggests that Edmund, and his father Robert, before him, were not in business for themselves but working for someone else. During Victorian times, 1837 onwards, Rossendale became the centre of the shoe industry. The Union of Boot, Shoe and Slipper Operatives was founded in Waterfoot. Most of the published sources deal with the development of slipper manufacture from the 1870s, developed from the felt industry around Waterfoot. Shoemakers were plentiful around Goodshaw by the 1841 census. This census shows Edmund, in his late 50s or early 60s, living at Goodshaw with Ann and four children and working as a shoemaker. There was also a cotton weaver in the house named Ann Eastwood, who was presumably another member of Ann’s family. No occupation is given for Henry. Mary had left home, but Peggy, aged 25, was living at home with her parents. She was unmarried and no occupation is given. In 1851 she is still at home and unmarried. Her occupational status is unreadable, but it might be ‘imbecile’. At the 1881 census, she was an inmate of the Haslingden Union Workhouse, Pike Law, Rawtenstall. She was 67, single, and described as an ‘imbecile’. Ellen was living at home, aged 12, and not in employment. By 1851 she was 21, unmarried, living at home and working as a cotton weaver. When his son James married in 1845, Edmund’s occupation, and probably his address, were still the same. In 1847 the Rev Abraham Nichols and a group of worshippers, including Edmund and Ann, broke away from Goodshaw to found a new church, using the old Roman Catholic Mission building at the bottom of Pinner Lane in Crawshawbooth. They built Sunnyside Baptist Chapel on Burnley Road, Reedsholme about 1850. Edmund had already been made a deacon at Goodshaw and became the senior deacon at Sunnyside. Although Edmund and Ann’s children were born in the early part of the century, their names were not entered into the Goodshaw Baptist Church register until January 1848, at the parents’ request. No baptism date is given. They were by now well into adulthood. The Baptists practiced believer’s baptism, but this often took place in adolescence. At the 1851 census, Edmund, 72, and Ann, 65, are living at 104 Sunnybank, Crawshawbooth, with two adult daughters. Edmund now gives his occupation as shoe repairer. I saw both G’father and G’mother in the flesh. They lived in the middle house at Sunny Bank in Goodshaw Lane. He was a shoemaker or cobbler. I used to sit at his bench watching him at work. If I was doing anything wrong he used to say. Son. Son, be a good boy. G’father died Decbre 5th -/54. Buried at Sunnyside on the 9th. W Abraham Nicholls preached his funeral sermon the 1st sabbath in January -/55. He read from 25 ch of Genesis 8 to 11 verse 25th Matthew 1st to 11th verse preaching from the 6th verse of 5th Chap of 2n Corinthians. He had been a deacon under Mr Pilling at Goodshaw then under Mr Nicholls. Came with him to Sunnyside about 1850. Built the present place. G’mother died August 27th -/54. Both buried at Sunnyside next to my father and another. I went to the funeral of both. Ann’s obituary in the Baptist Times gives her date of death as 26 Aug 1853. Died, August 26th, 1853, at Sunnybank, aged sixty-five years, Ann, wife of Mr Edmund Priestley, deacon of the Baptist church, Sunnyside, Lancashire. Mrs Priestley was baptized by the late Mr John Pilling, of Goodshaw, more than ? years since. In 1847 she joined her husband in the formation of the new interest at Sunnyside, and her consistent character and punctual attendance upon the means of grace, her affectionate attachment to the young members, her ardent love and prayers for peace and prosperity, her strong feelings of regard for the ? and happiness of her pastor, will be held in affectionate remembrance. Her faith was strong in the closing scene, she died in the humble hope of endless life through Jesus Christ. On the 31st of August her remains were interred in the cemetery of the new Baptist chapel, Sunnyside, and on the 11th September 1853, Mr Nichols paid the last public mark of respect to her memory and affection by preaching from 2 Cor xiii. 11, “Finally, brethren,” &c as expressive of her love towards the church and congregation at Sunnyside. A valuable and highly esteemed deacon of the baptist church, Sunnyside, Lancashire, was buried at Sunnybank , December 5th, 1854, aged seventy-seven years, and was interred at the baptist chapel, Sunnyside, December 9th, 1854, four of the trustees carrying him to his resting-place, and four of the young members of the church bearing the pall. Our departed brother was brought to the knowledge of the truth and baptized by the late Mr John Pilling of Goodshaw, about fifty years since. His religious experience was more steady than elevated, more serious than joyous, seldom rising above occasional doubts and fears, always entertaining a very humble opinion of himself and his abilities. It was however always satisfactory, and the general impression produced upon the minds of others was, Edmund is a good man. His affection for his pastor was very great; his concern for the peace and prosperity of the church always evident; and he rejoiced greatly in the erection of the new house of prayer at Sunnyside, doing what he could to promote the enterprise. He was also much attached to the young members of the church, often spoke about them with deep concern, anxious that they should be right; honourable in the world, a blessing to their minister and families. After the death of Edmund and Ann, their daughter Ellen looked after the mentally retarded Peggy. John was buried in Goodshaw old ground. Robert became a soldier in the East Indian Regiment and died at sea. Betty married a Pickup and died at Burnt Hills, Clowbridge. Mary married a Lonsdale and died at Rawtenstall. Peggy was buried at Sunnyside. Henry died young and unmarried. Ann married a Haworth and died at Haslingden. Ellen married James Heyworth, a cashier at Love Clough. Both were buried at Goodshaw.